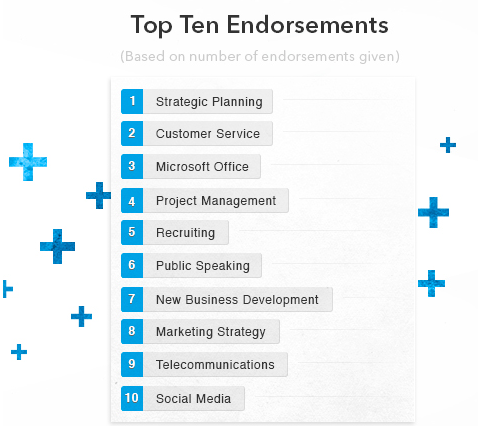 Endorsements, a lightweight way for people on LinkedIn to recommend each other’s skills, has picked up some significant traction in its first five months of life. Today, LinkedIn is announcing that Endorsements has passed the 1 billion milestone — with 58 million members getting recognition on their profiles for different areas of expertise, according to a blog post from Peter Rusev. The marker is a sign that, were LinkedIn so inclined, it could likely give sites likes Klout, which measure influencer status, a run for their money. Before the introduction of endorsements five months ago, LinkedIn let users gather testimonials about their skills — but these were in the form of longer recommendations. Those written recommendations are still there, but what endorsements has done is turn this into a quicker process, as fast as it takes a user to click a box, with a prompt for adding them in appearing at the top of profile pages to encourage more endorsing. Endorsements serve several purposes for LinkedIn. For starters, they help increase engagement on the site, and keep people on the site for longer, giving them more possibilities to get exposed to other services (and ads). They also give users the chance to provide more enhanced pictures of themselves — useful, since one of the main reasons for LinkedIn usage (despite all its moves to become central news information hubs) remain around people finding jobs. And along those lines, endorsements are also getting used as ways for people to network with each other. LinkedIn tells me that when users get endorsed their profiles appear higher up in searches, making them four times more likely to be seen by others. For now, LinkedIn is still focused on building up a massive data set based on these endorsements and is therefore keeping all monetization elements out for now. “The product is completely free to access/use and there are no plans to make this a premium experience,” a spokesperson tells me. However, that’s not to say that LinkedIn’s endorsements won’t be evolving in other ways, including seeing the data get integrated into other paid products. “We are looking at different ways to integrate the signals we are gathering from endorsements into other products across LinkedIn, such as search and our recruiter product,” she notes. “Our focus here will be on the most natural way for the data to help our members be found on LinkedIn.” That follows on from the fact that your profile is four times more likely to be found if you get endorsed. “We are also continuing to improve the algorithm behind the suggestions we prompt to our members to help them give relevant endorsements to their connections,” she added. LinkedIn is keen to show that it is a social network for the whole of the working world, not just those of us who spend the whole day thinking about technology, glued to our screens. LinkedIn has singled out what it claims to be both its first endorsement and its one-billionth. They are, respectively, an endorsement was for C++ programming skills, and an endorsement for water treatment — conveniently jobs at the opposite ends of the career spectrum. Still, the top 10 list remains fairly firmly in white-collar territory.